I agree that watching The Gathering really isn’t necessary. For one thing, Midnight on the Firing Line was written to accomplish the same task of introducing the series. Watching them in close proximity, which I did a few months back, can feel tediously repetitive. The new viewers on the Downbelow podcast also noted this, so it’s not just someone like me (whose response is shaped by previous knowledge) who reacts that way to the combination. That being said, I think that’s there’s a little more than exposition going on in The Gathering’s ( often clunky, it must be said) presentation of the basic facts of the station and its world in leisurely detail. I think there’s also something else going on here, that reflects what B5 was trying to do and its sources and influences. One of the traditional pleasures of literary SF is the reader’s exploration of invented but coherent worlds. Encountering the details of these worlds and “how they work” (especially finding out about the background of an invented future history) is valued as part of the reading experience for its own sake, and asking what all this has to do with the plot is to miss the point. B5 is strongly (perhaps a little too strongly) rooted in this sort of thing – it’s recognizably a universe that someone steeped in midcentury science-fiction would create. Tolkein is another acknowledged influence, and the relevance of that is pretty obvious. Televised SF, on the other hand, had typically (actually, I can’t think of any exceptions) built up its universes piecemeal, for the purposes of particular episodes of episodic television. This notoriously produced the phenomenon of Star Trek fans worrying about how some element of a new story in TNG fit in with some aspect of the Federation that had been created to drive the plot of a single one-off story in the 1960’s. B5 is trying to do the opposite well. The Gathering’s definite “As you know…” tendencies serve to indicate that to the viewer, to say “This isn’t a universe where we’re making this up as we go along,” on the assumption that the viewer will tolerate this and even enjoy it because s/he finds the world-building interesting in itself. The choice to begin with a mystery reinforces this, because that’s also about the progressive revelation of detail, and is a genre that traditionally tolerates the presentation of extraneous detail in order to conceal the crucial pieces of plot information. Of course, that doesn’t mean that one actually has to find this pleasurable. I personally find Midnight on the Firing Line’s approach of “Let’s foreground the details that are about conflict, diplomacy, the inescapable presence of history, and above all characters” much more effective. So, first off, for the most part I liked this. To me it was a creative product that wore what it was trying to do and how it was going about it, right out there in the open. Sort of an open kitchen restaurant of story telling. On the one hand this makes it not excellent. A really good story will distract you from the bones of its structure and exactly what narrative work it is trying to accomplish with emotion and tension and beautiful scenery. Possibly a good example of something that manages to do this (just barely) is the Avengers movie. Watching it you are all caught up in it and it is only on the way home that you start to see Joss practically ticking off bullet points all the way through. One the other hand it tells you what it is trying to do, uses a structure very well suited to doing that work, and then accomplishes its task. That may not make it excellent, but it does make it pretty good. You can see that out writer had a concept that he was trying to sell. He knew the biggest strength of that concept was the word building and the diverse characters. Therefore he chose a mystery plot. This does two things (well three but I didn’t know until after i watched this that he had also done Murder: She wrote). It allows him to spend very little time explaining the plot, because everyone knows how mystery stories work, and it allows him to get it the maximum amount about his awesome world and characters in front of the audience because the way a mystery works is that you have a few characters who spend the whole story finding stuff out about other characters. (It also probably made it easier for him to get his big ideas into format, being that he was used to doing mystery stories for TV). All those little drips of exposition work within a mystery format in a way that would have been very annoying in another set-up. I think perhaps this ep is more annoying to people who have already seen a bunch of B5 in a way it wasn’t for me because then you have an expectation of a certain type of narrative that this just isn’t yet. This was him nearly conceding the plot all together in an effort to get as much as possible of what he thought could sell the series on the screen. It may be obvious that that is what is being done, but it seemed to me that it was done with a lot of structural proficiency if not a talent for great dialog. This was truth in advertising. If you liked diverse and complex characters, a big world we had obviously only seen part of despite all the exposition, and these new-fangled computer graphics you were sure to enjoy the rest of the series. If you were looking for snappy exiting plots wrapped up in 45-90 minutes, lovingly detailed model shots of space ships, or easily understood alien motivations, you were in the wrong place and knew it. Saw that my comment above duplicates some of yours. Apologies. But I think that the point about the familiarity of the mystery plot allowing the show to dwell on the background details is a very good one. I think that this reliance on a familiar genre to enable the viewer to navigate things is a well that the show goes back to on occasion. But not always successfully: Believers (not my favorite episode) is hospital drama and TKO (again, not one of my favorites) is sports drama. Your argument suggests that one reason why those episodes don’t work so well is that they don’t introduce anything interesting in the background to make the familiarity of the plot worthwhile. I might cautiously advance Survivors as another place where the trick is done fairly well: it’s a familiar “wrongly accused man in conspiracy thriller” plot, but because it fills in important elements of Garibaldi’s background that will resonate throughout the series and because it’s about the big aspects of Earth politics that matter for the series, one ignores the familiarity and goes along for the ride. At least I do – I’m aware that not everyone is as forgiving of Survivors. 1) There was some talk about whether or not this episode should have been the pilot, perhaps in favor of one with more “action.” One example used was how Fox chose to start “Firefly” with their second, more action-packed episode “The Train Job” rather than “Serenity,” whose fate was to be aired after the decision was already made to cancel the series. Note that I said “cancel the series.” The strategy didn’t work, did it? Cancelled way before its time! Welcome aboard and I endorse your screen name. So happy! Chip just mentioned this on the 2mintimelord and now I hear Erica, whom i love from Verity. I love B5 and I love you two. (I’m sure I will love Shanon) I love this cast and I’m just 6min in on Ep.1 Thank for taking the time to put these things together to entertain those how love them. My happy thing this week is this show! I enjoyed your discussion! I enjoyed “The Gathering” a lot less, even though I don’t think it’s terrible, and, in fact, is better than I remember. 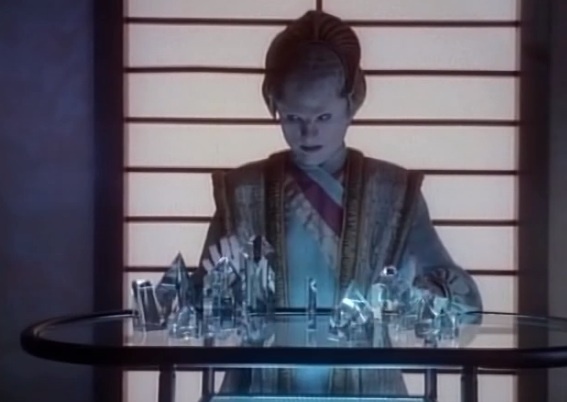 I first saw it midway through my original watch of B5. I enjoyed seeing it at the beginning a lot more (e.g., I wasn’t distracted by, “Where’s Ivanova? Where’s Talia?”). I am impressed by how much of his vision JMS managed to get on-screen, and I like that it’s a more textured universe than TNG (but not DS9; I think B5 and DS9 are pretty much peers on that score, although it took DS9 a lot longer to get there than B5 did). I disagree slightly about the “grittiness” of B5. Frankly, it feels on a par with DS9 for that, too – “too darn clean.” At least in the pilot movie, B5 is a relatively clean, well-lighted place from top to bottom, stem to stern, even in its supposed “seedier” parts. I think the reimagined BSG showed us what gritty futurism looks like, and B5 suffers in comparison. Jurasik and Katsulas as Londo and G’Kar are the best things in this movie. I am amazed at how wooden and without affect Sinclair is – not only here but, as I remember, throughout the first year. The rest of the cast, frankly, turns in pretty weak performances. The lowest moment, for me, was Dr. Kyle’s description of what it was like to look on the face of a Vorlon. Egads, what terrible writing, terribly delivered. If you’ve discussed this in a subsequent podcast, please forgive (“I here am new”), but I noted the camera giving us some time to admire the mural on the wall in the bar (is that the Zokolo, if I remember?). What is that a depiction of? It looks like Egyptian pyramids on the left, but then veers off into other (extra-terrestrial?) stuff on the right. I don’t remember this playing into the series, but maybe I’m wrong – any insights? Finally, what do you think of Sinclair’s praise of “plain old human stubbornness” at the end? On the one hand, yes, stick-to-it-iveness is admirable. On the other, remember the old definition of crazy: doing the same thing over and over, expecting different results. “If something we value is destroyed, we rebuild it until it lasts” – well, what if what you value is your multimillion dollar shore home, where hurricanes are bound to come year after year? At what point do you temper stubbornness with caution, and might that sometimes be wisdom? I watched the Gathering when it first aired and disliked it thus not continuing to watch the series. When the series got picked up by TNT for the 5th season, TNT did a daily rebroadcast of the series and I got completely hooked. I have to say that the Gathering is the worst B5 episode. I don’t think it was needed for world building or character intros. It’s most important function is that it was good enough to be picked for series. Well, this is a bit late, isn’t it? Saw a mention of the podcast from a Twitter friend, realized I had an hour to spare, and here I am. The Gathering. Hooboy. I watched it first-run. You know what? I still think it’s a shame they couldn’t retain Stewart Copeland. (I AM that music nerd who notices these things.) Otherwise, I agree with the three of you, absolutely. That’s what we’re here for. We want these episodes to last. Bolster by GreyDuck’s late comment, here I am too! I remember trying to watch B5 in season 1 and just not getting into it… a couple of years later, I dropped into a season 3 episode without planning to and fell in love with it. Watched every episode from there out and was devastated when it was cancelled at end of season 4. When TNT picked it up and announced that they were running the entire series…. well, I bought a bunch of brand new VHS tapes and recorded the entire run. I would program the VCR to start recording and tape the show as it would start before I got home from high school. I taped a note on it warning my family DO NOT TOUCH THE VCR!!! I labeled each tape meticulously, season, tape #, episode list. I saw many episodes for the first time, and I could appreciate it with the foreknowledge of what was to come.